From the Robert Graham Center for Policy Studies, Washington, D.C.; and the American Board of Family Medicine, Lexington, KY.
Background: The Institute of Medicine recently called for greater graduate medical education (GME) accountability for meeting the workforce needs of the nation. The Affordable Care Act expanded community health needs assessment (CHNA) requirements for nonprofit and tax-exempt hospitals to include community assessment, intervention, and evaluation every 3 years but did not specify details about workforce. Texas receives relatively little federal GME funding but has used Medicaid waivers to support GME expansion. The objective of this article was to examine Texas CHNAs and regional health partnership (RHP) plans to determine to what extent they identify community workforce need or include targeted GME changes or expansion since the enactment of the Affordable Care Act and the revised Internal Revenue Service requirements for CHNAs. Methods: Texas hospitals (n = 61) received federal GME dollars during the study period. Most of these hospitals completed a CHNA; nearly all hospitals receiving federal GME dollars but not mandated to complete a CHNA participated in similar state-based RHP plans. The 20 RHPs included assessments and intervention proposals under a 1115 Medicaid waiver. Every CHNA and RHP was reviewed for any mention of GME-related needs or interventions. The latest available CHNAs and RHPs were reviewed in 2015. All CHNA and RHP plans were dated 2011 to 2015. Results: Of the 38 hospital CHNAs, 26 identified a workforce need in primary care, 34 in mental health, and 17 in subspecialty care. A total of 36 CHNAs included implementation plans, of which 3 planned to address the primary care workforce need through an increase in GME funding, 1 planned to do so for psychiatry training, and 1 for subspecialty training. Of the 20 RHPs, 18 identified workforce needs in primary care, 20 in mental health, and 15 in subspecialty training. Five RHPs proposed to increase GME funding for primary care, 3 for psychiatry, and 1 for subspecialty care. Conclusions: Hospital CHNAs and other regional health assessments could be potentially strategic mechanisms to assess community needs as well as GME accountability in light of community needs and to guide GME expansion more strategically. Internal Revenue Service guidance regarding CHNAs could include workforce needs assessment and intervention requirements. Preference for future Medicaid or Medicare GME funding expansion could potentially favor states that use CHNAs or RHPs to identify workforce needs and track outcomes of related interventions. The updated requirements for hospitals seeking tax-exempt status under the ACA and enforced through the Internal Revenue Service now include the mandate that hospitals seeking tax-exempt status conduct a community health needs assessment (CHNA) at least once every 3 years and adopt a subsequent implementation strategy.9 CHNAs must be publicly accessible. Contrasted with the prior tax-exempt requirement, which remained mostly unchanged since 1969, the new rule requires a community assessment that takes into account input from individuals who represent the broad interests of the community, dissemination of the assessment, and creation of an implementation plan that addresses every stated need or explains why needs were not addressed. This is repeated in 3-year cycles, propagating the cycle of assessment and intervention, anticipating that positive community effects will be found.10 This new requirement has been called “the most important change in the accountability of nonprofit organizations” in over 60 years.11 However, CHNA requirements do not specifically call for an assessment of workforce needs or GME allocations, and while ensuring GME accountability to population needs is a complex endeavor and is not named as a focus of CHNAs, the potential for synergy between 2 streams of public funds in health care is intriguing and was examined here. From 2002 to 2012, medical school enrollment in Texas increased by 31%. Without congruent growth in GME positions, by 2016 an estimated 137 physician graduates would be unable to complete in-state GME training because of a lack of positions, representing $23 million of state investment in medical education that will go out of state.14 Some have argued that expansion of medical school training is not a defensible argument for pouring more public funds into GME and that, nationally, hospitals have been able and willing to fund GME expansion without federal dollars.15 However, most hospital-funded GME expansion has occurred in subspecialty training and will not solve intractable workforce shortages, especially in Texas. Because of its pockets of underserved areas, its relative lack of funding for GME, and its use of Medicaid funds to expand GME,17 Texas offers an important option to review this timely opportunity to hitch GME reform to the community needs assessment wagon. Our objective was to examine Texas CHNA and RHP plans to determine to what extent they (1) identify community workforce needs and (2) include targeted GME changes or expansions, with a focus on hospitals accepting GME dollars. To our knowledge, no review examining CHNA content around workforce needs has been undertaken. Using the Centers for Medicare and Medicaid Services Health care Cost Reform Information System data, a total of 61 hospitals in Texas accepting GME dollars were identified. Once these hospitals were listed, their tax statuses were then examined to determine which GME-funded hospitals were tax exempt and therefore mandated to complete CHNAs. The tax status of Texas hospitals was requested from the Texas Hospital Association. This list was also cross-referenced with the list of hospitals that need to report community benefit per the Texas Health Department. Once this list was created, a spreadsheet was made to track hospitals by county, GME status, tax exemption status, and community benefit status. Once this spreadsheet was compiled, CHNAs and RHPs were obtained. CHNAs were easily found and accessed through a Google search, as CHNAs must be publicly accessible. RHP plans were similarly accessed. All 61 hospitals were reviewed for participation in an RHP, and if a hospital completed both a CHNA and participated in an RHP, both were reviewed. Of the 61 hospitals identified, 38 had an available CHNA; another 21 hospitals took part in an RHP, of which there were 20 total, and therefore participated in needs assessments and in the formulation of intervention plans as a part of an RHP-sponsored DSRIP proposal. All 20 RHPs were reviewed. One CHNA was very specialty specific, and 1 hospital did not have a CHNA accessible online, nor was it mentioned in any RHP plan. One reviewer (MR) read all CHNAs and RHP proposals and documented mention of workforce needs in the community and mention of GME as community benefit. This was done over several months, with results periodically reviewed with a second collaborator. Plans for intervention based on CHNAs or RHPs were also read closely for descriptions of interventions specifically designed to address workforce needs through GME funds. Specifically, mentions of GME funding, community benefit, and changing or increasing GME funding as a proposed intervention for identified workforce needs were noted. After CHNAs and RHP plans were read, these documents where then electronically searched for the terms graduate medical, residency, medical education, GME, community benefit, or resident physician to ensure any mention of GME-related endeavors was not missed. Data were collected in an Excel spreadsheet that divided the state of Texas by county; described the assessments generally (duration, completion by consultant group, etc. ); noted which hospitals received GME funds, their tax status, and their participation in an RHP; held links to copies of each CHNA or RHP, their mention of GME as a source of community benefit, and the presence of a publicly accessible implementation plan. In addition, the specifics of their plans around GME were noted. CHNA and RHP had been released from 2011 to 2015. CHNAs are submitted on 3-year cycles. In general, CHNAs ranged from a dozen pages to a few hundred, and were often completed by consultants. Assessments typically involved a data-driven analysis followed by consensus from community stakeholders, culminating in a consolidated list of identified needs. Implementation plans were of varying lengths and addressed each identified need or stated why an identified need was not going to be addressed. All RHP plans were reviewed. RHP plans ranged from several hundred to thousands of pages. RHP assessments, similar to CHNAs, were based on data analysis and stakeholder input. RHP proposals were more detailed than CHNA-based implementation plans, and proposals included cost estimates. RHP plans included multiple counties and encompassed multiple hospitals and clinics. Of the 61 hospitals receiving GME funding, 38 hospitals submitted CHNAs. Of these, 34 identified mental health needs, 26 identified primary care needs, and 17 identified subspecialty workforce needs. Of the 36 available implementation plans (2 were in progress at the time of review), GME funding increases were planned by 1 for psychiatry, 3 for primary care, and 1 for subspecialty training (Table 1). Of the 20 RHPs, all 20 identified mental health workforce needs, 18 identified primary care workforce needs, and 15 identified subspecialty care workforce needs. Three RHPs proposed increasing GME funding for mental health training programs, 5 proposed to do so for primary care, and 3 for subspecialty care. RHP results were easily geocoded by manually entering counties, as RHPs align along county lines (Figure 1). Of note, 2 RHP plans considered GME expansion to address identified workforce and access-to-care needs but later discarded these as being financially unattainable. 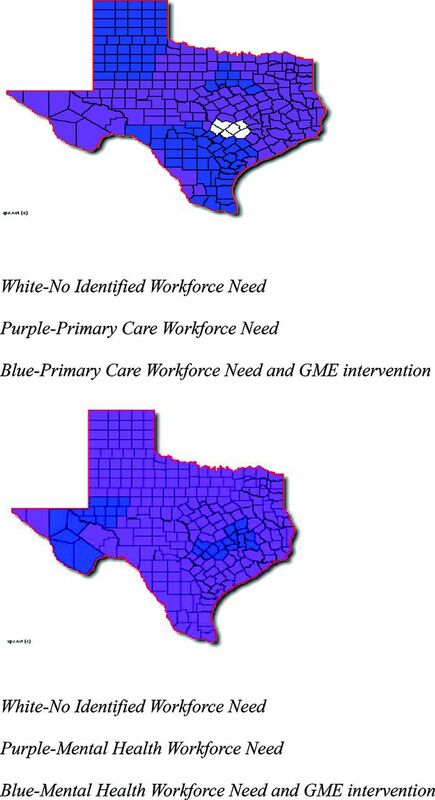 Texas regional health partnerships (coalitions of counties) and workforce needs in primary care (top) and mental health (bottom). White indicates counties with no workforce need; purple, counties with a workforce need; and blue, counties with a workforce need and a graduate medical education intervention. Institutional accountability to the community when receiving public funding or tax exemptions is not a new concept. The ACA-generated increase in responsibility for community benefit of hospitals applying to the Internal Revenue Service for tax-exempt status could offer an important mechanism for addressing related calls for making GME funding more purposeful and accountable, allowing for purposeful execution and modifications based on feedback. Because many GME-funded hospitals are not tax exempt, Texas—because of its regional needs assessment and planning under current Medicaid waivers—offered a unique example to study this opportunity more broadly. Many CHNAs and RHPs identified workforce needs, and some attempted to address these with Medicaid waiver funding. Outside of Medicaid funding, there is no federal mechanism for responding to regional needs. In neurologic terms, GME funding is “locked in,” as there is little ability to move despite such acknowledged workforce needs. Given that states already allocate nearly millions of dollars to residency training, and some are expanding this investment, more could make informed decisions about targeted allocation of these precious resources. Our review of CHNAs and RHP assessments offers some hope that workforce needs may be related to greater stakeholder engagement, since the depth and range of other community needs mentioned were frankly striking. Many mentioned problems such as “low literacy,” “food deserts,” or “high levels of teen pregnancy.” Many of these concerns cannot be meaningfully addressed by hospitals, but they can be tackled through increased access to primary care and mental health services, and residency training sites are 1 way to provide this to the community. This should increase institutions' thinking about their role in larger community strategies to tackle community issues that affect health. Workforce gaps similarly need to be seen in this context—a community resource meant to resolve community needs, not just those of teaching hospitals.1 Much of the build-out of GME positions over the past decade have focused on remunerative hospital service lines. These training positions have contributed to an erosion of primary care production.2,18 Community assessments could help refocus the use of publicly funded physician training as part of a broader hospital-community partnership for resolving health needs. New CHNA requirements offer tax-exempt academic hospitals an opportunity for aligning GME with their work in describing, measuring, and then executing interventions addressing their communities' needs. Though the training of medical professionals satisfies community benefit requirements, hospitals receiving GME dollars do not always mention these funds in their CHNAs, and though GME accountability is being increasingly discussed, there is no specific requirement or metric to accomplish this. Mechanisms to ensure accountability are difficult to devise. Indeed, while deciding what outcomes are desirable—what specialties are needed to serve the population and in which regions of the nation they are most needed—may not be complicated, the methods of structuring the GME system to obtain those results is less clear. Few programs stand out in their capabilities to recruit and retain a physician workforce compatible with community need, understanding that a clear correlation exists between where a physician trains and where he or she practices.19,20 Our review shows that the majority of institutions are able to readily identify their workforce needs, but few choose to respond to them with GME expansion. Our work has clear limitations. First, not all CHNA reports were available at the time of study. Second, it is unclear whether plans were approved for funding through RHPs; if so, whether these plans were executed; and to what extent they were successful. In addition, mention or justification of GME-related spending is not mandatory in the CHNA or RHP process. Expansion of GME in specific specialties also does not necessarily ensure those positions will be filled by residents. The purpose of this review was to examine to what extent community members recognize workforce needs and to examine whether GME funding was considered as a mechanism to allay these needs. Last, though workforce needs were mentioned often without plans to increase GME funding, they were often linked to plans for increased physician recruitment or practice optimization. Hospital systems did have plans to address these workforce gaps. The call for accountability for public funds in health care—through GME or in lieu of taxation—is not likely to fade.21 Mechanisms demonstrating accountability will be important additions to the process of justifying the expenditure of public funds. Such mechanisms will be most meaningful if the medical community creates and shapes them. The authors thank Dr. Kenneth Lin for his contribution to this work. To see this article online, please go to: http://jabfm.org/content/30/4/537.full. Accepted for publication March 22, 2017.
. Accelerating physician workforce transformation through competitive graduate medical education funding. Health Aff (Millwood) 2013;32:1887–92.
. Towards graduate medical education (GME) accountability: measuring the outcomes of GME institutions. Acad Med 2013;88:1267–80. The Josiah Macy Jr. Foundation. Ensuring an effective physician workforce for America. April 2011, revised November 2011. Available from: http://macyfoundation.org/docs/grantee_pubs/JMF_GMEBook_web_Revised11.2011.pdf. Accessed May 15, 2015. The Josiah Macy Jr. Foundation. Ensuring an effective physician workforce for the United States: recommendations for graduate medical education to meet the needs of the public. November 2011. Available from: http://macyfoundation.org/docs/macy_pubs/JMF_GME_Conference2_Monograph(2).pdf. Accessed May 15, 2015.
. Reforming the financing and governance of GME. N Engl J Med 2014;371:792–3. Community health needs assessments for charitable hospitals. Action: notice of proposed rulemaking. Federal Register 2013;78:20523–44. Available from: http://www.gpo.gov/fdsys/pkg/FR-2013-04-05/html/2013-07959.htm. Accessed March 15, 2015. Association of American Medical Colleges. Achieving accountability: a proactive process for academic medical centers. Washington, DC: Association of American Medical Colleges; 2005. Johns Hopkins Health System. An overview of community benefits in fiscal year 2012, serving the community. Avaiable from: http://www.hopkinsmedicine.org/johns_hopkins_bayview/_docs/community_services/communitybenefitsbrochure.pdf. Accessed March 12, 2015. Internal Revenue Service. New requirements for 501. (c) (3) hospitals under the Affordable Care Act. Accessed March 15, 2015.
. Hospital community benefits after the ACA: the state law landscape (issue brief). The Hilltop Institute, UMBC.2013. http://www.hilltopinstitute.org/publications/HospitalCommunityBenefitsAfterTheACA-StateLawLandscapeIssueBrief6-March2013.pdf. Accessed March 12, 2015.
. Does it all add up? Flaws in Schedule H community benefit reporting will affect nonprofit multi-hospital systems. Trustee, March 1, 2010. Available from: http://www.trusteemag.com/articles/536-does-it-all-add-up. Accessed June 12, 2017. United Health Foundation. America's health rankings. Texas. Measure: primary care physicians. Available from: http://www.americashealthrankings.org/TX/PCP. Accessed June 15, 2015.
. The geography of graduate medical education: imbalances signal need for new distribution policies. Health Aff (Millwood) 2013;32:1914–21.
. An update on graduate medical education in texas. Texas Higher Education Coordinating Board. Presentation to the House Appropriations Committee Subcommittee on Education, February 22, 2013.
. The economics of graduate medical education. N Engl J Med 2014;370:2357–60. Texas Health and Human Services Commission. Waiver overview and background resources. Available from: https://hhs.texas.gov/laws-regulations/policies-rules/waivers/medicaid-1115-waiver/waiver-overview-background-resources. Texas Health and Human Services Commission. Texas Healthcare Transformation and Quality Improvement Program: Medicaid 1115 waiver proposal. Published July 13, 2011. Available from: https://hhs.texas.gov/sites/default/files/basic_page/waiver-1115-proposal.pdf.
. The redistribution of graduate medical education positions in 2005 failed to boost primary care or rural training. Health Aff (Millwood) 2013;32:102–10.
. Migration after fam med residency: 56% of graduates practice within 100 miles of training. Am Fam Physician 88:704, 2013. Association of American Medical Colleges. 2014 Physician specialty data book. Washington, DC: Association of American Medical Colleges; 2014:21–2.